The Viking Pools manufactures an impeccable product with unsurpassed service and a lifetime warranty. In addition to various pool styles and sizes, Viking offers more options than any other pool manufacturer with features like perimeter tile, inlaid tile, tile mosaics, Crystite® pool finishes, built-in water features like cascades and streams, fiber optic and LED lighting, and in-floor cleaning systems to provide you with a superior pool that compliments your home and your lifestyle. Viking makes owning a pool a lifetime of pleasure and enjoyment. Viking’s state-of-the-art four-layer construction begins with durable, high-polished material. The primary application of Gel Coat or Viking’s unique Crystite is applied to give the pool a gorgeous finish. This smooth finish is non-abrasive to the skin and swim wear and is more resistant to algae than other types of pools. Viking’s finish resists the problems associated with unbalanced water chemistry, requiring less chemical maintenance, labor, and electric, saving you time and money. The second layer is Viking’s Vinyl Ester Resin, which is combined with fiberglass to provide the greatest impact resistance and optimum blister protection available. This Viking created formula became the benchmark of the fiberglass pool industry. In the heart of every Viking pool is an exclusive ceramic core layer that adds greater strength to the pool walls and provides enhanced water resistance. 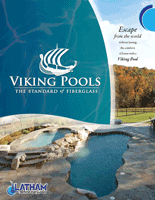 The final stage of every Viking pool is specially designed resin and hand laid fiberglass. Viking’s pools withstand drastic temperature changes and resist freeze-thaw climates. Viking is the only pool manufacturer that offers an earthquake warranty. Viking Pools takes great pride in manufacturing a quality product using the latest technology to lead the way in the fiberglass pool industry.